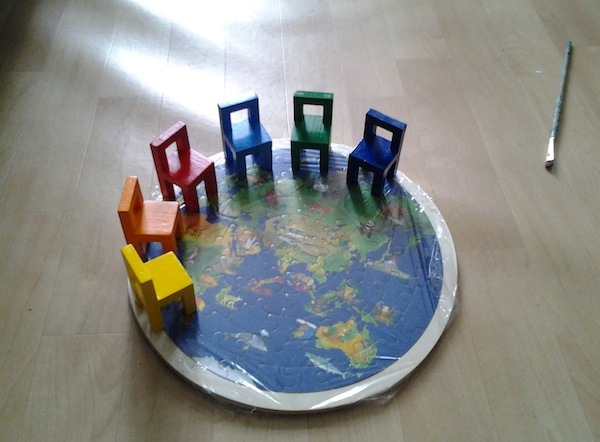 This series symbolically represents games, which we play in our lives, in our society. Collage painting made with photos printed on paper, glue, acrylic colors, charcoal and varnish on canvas. 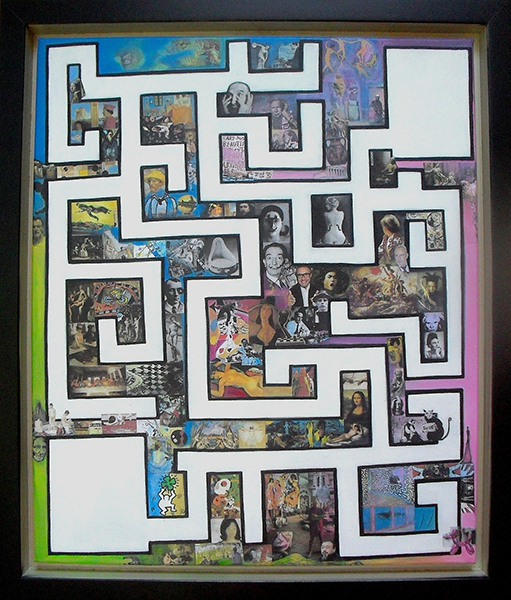 This piece symbolically presents the life of an artist as a game he/she has to play to reach their goal, which is actually the game itself. Being an artist does not mean just to be creative, it means also to know the history and present of art, to know the art market, to be competitive and fast, to reach the public and send the message to the public. It also means to lose sometimes and be lost because being an artist means to experiment and always researching. Being an artist is actually a hard game to play… but definitely the best one. 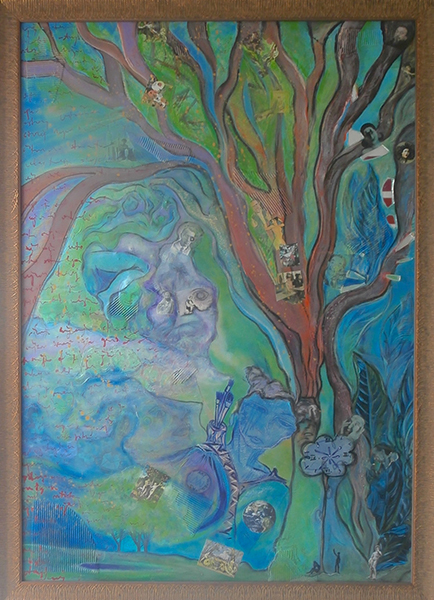 Collage painting made with photos printed on paper, glue, cardboard, charcoal, acrylic colors and varnish on canvas framed with wooden colored frame. Collage painting made with photos printed on paper, glue, cardboard, acrylic colors, charcoal, crayons, mirror and varnish on wood. 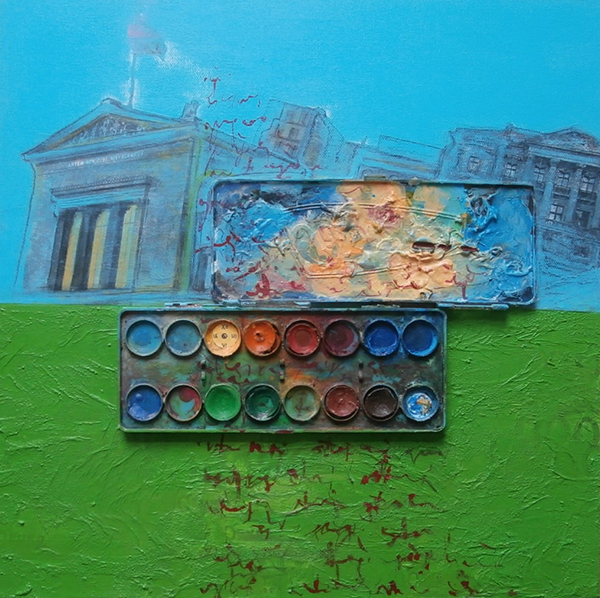 Started in Venice 2008, finished in Berlin 2012. 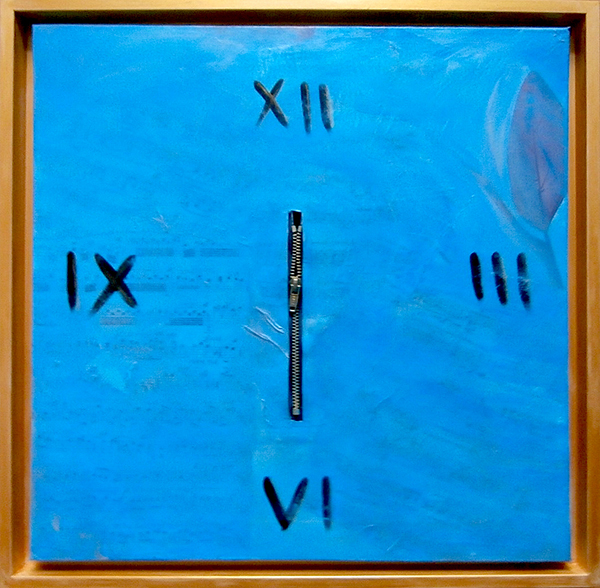 This piece has been made in collaboration with my fellow friend artist Riccardo Attanasio. 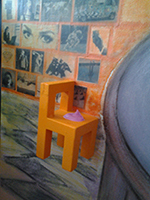 Collage painting with photos, small wooden chairs, charcoal, crayons, acrylics and varnish on canvas. 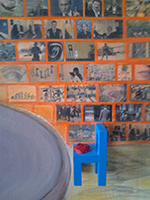 We find bricks as a symbol of society here as well, but in this case bricks are used for background of the place where the game is actually being played. 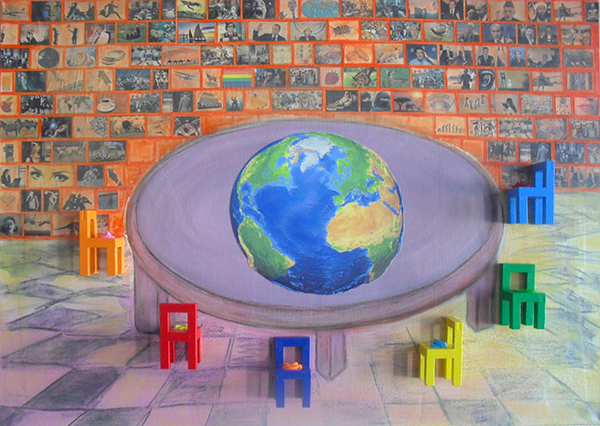 These small bricks are photos of different situations from our society: politics, religion, food, art, money, family, everyday life… The big table is the table where the rules about the game are discussed. 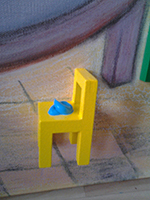 Each of small wooden chairs glued on canvas has mound of color on the seat, which actually looks just like a poop. 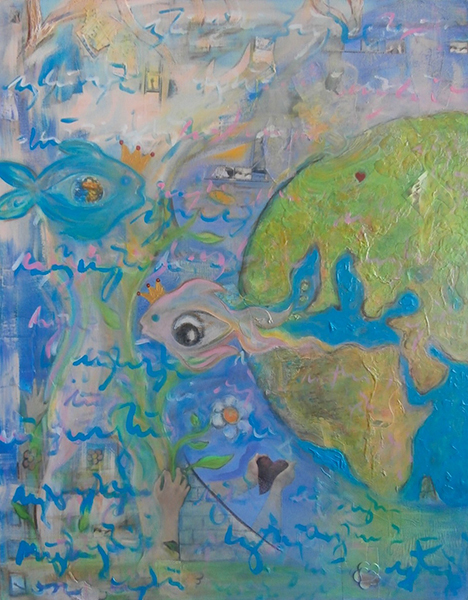 Ironically and symbolically, provocatively and critically, this work presents the most powerful people of this society, which are actually ruling all our world according to their needs. 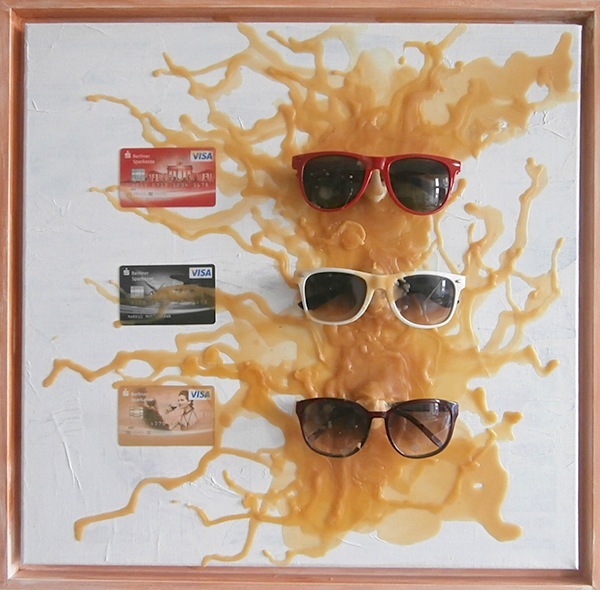 Collage painting with newspaper, acrylic color, glasses, samples of credit cards, wax and varnish on canvas with wooden painted frame. In our society you can not live without a bank account anymore. You need all these cards, documents and other papers to play the game! 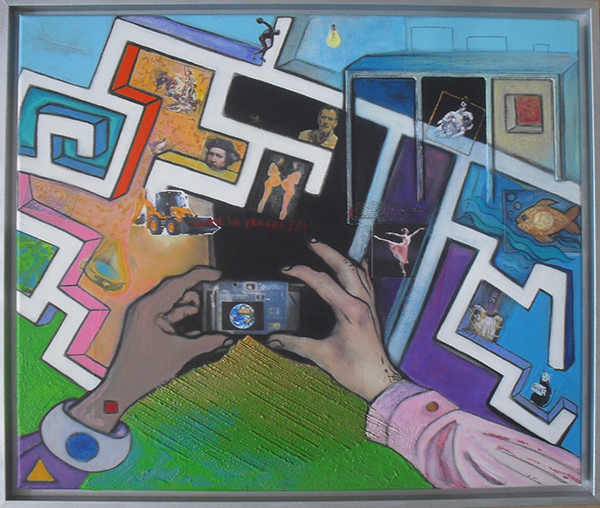 Collage painting with mirror, acrylic colors and varnish on canvas with wooden and colored frame. Collage painting made by prints of musical notes on paper, glue, acrylic colors, zip and varnish on canvas with wooden and colored frame. 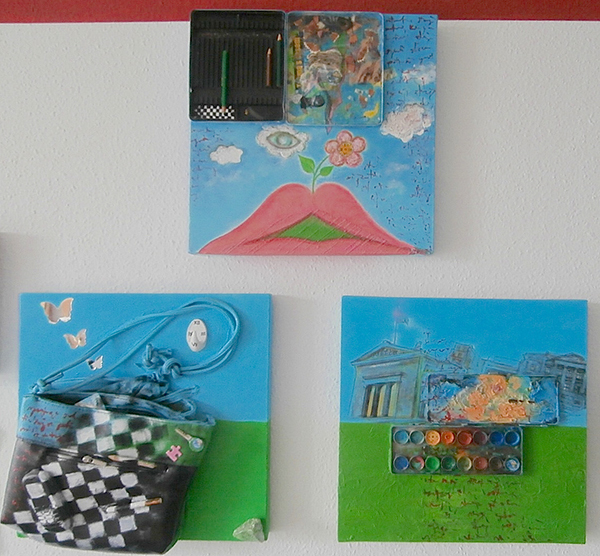 Triptych installation made by three different canvas. 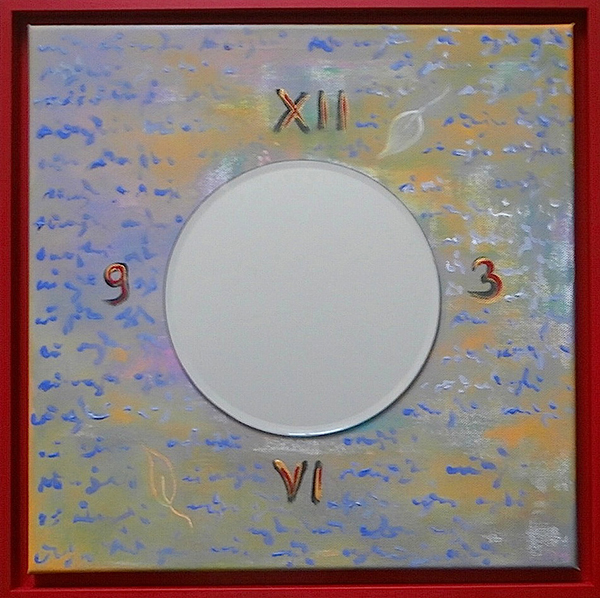 Dimensions of each canvas are 40x40x3cm. 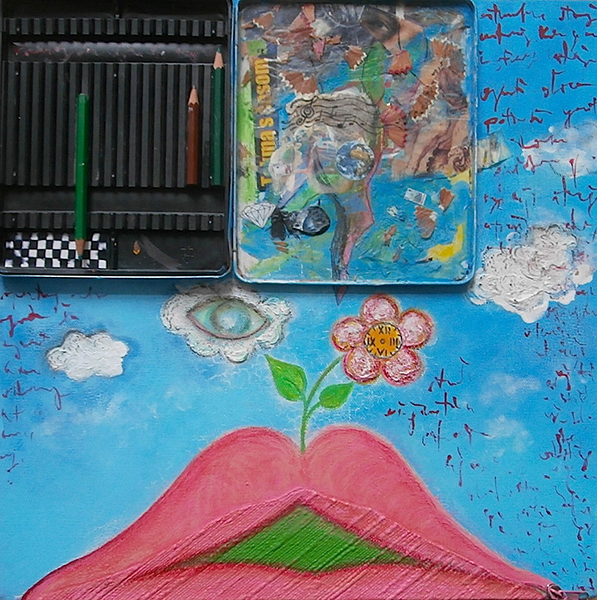 Collage painting made by paper, glue, box with pencils, acrylic colors, crayons, charcoal and varnish on canvas. Acrylic colors, water colors, plastic, paper, glue, napkins and varnish on canvas. 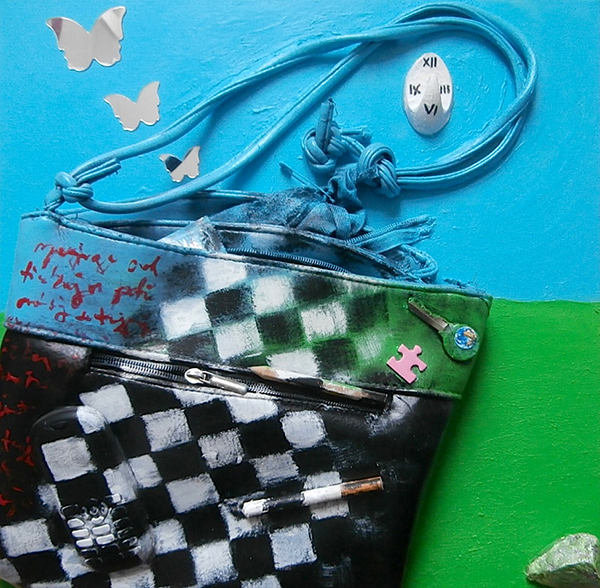 Bag, zip, cigarette, cellphone, key, photo, mirror, stone, pencil, plastic, cardboard, acrylic colors and varnish on canvas. Collage painting made with photos printed on paper, glue, acrylic colors, mirror, charcoal, crayons, wax and varnish on canvas.